In WWDC 2015, Apple announced that Swift would be open source. Shortly after that, in December 2015, Swift’s codebase was public on GitHub. Open sourcing the Swift codebase introduces developers to a multitude of opportunities and expand the use of Swift worldwide. As expected, developers swiftly explored the various new applications of Swift (no pun intended). 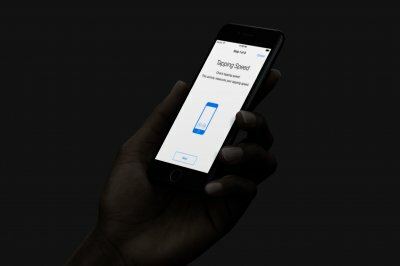 One such application is using swift code to power a web app which we will explore in this tutorial. There are many benefits to having a strictly typed language on the server. 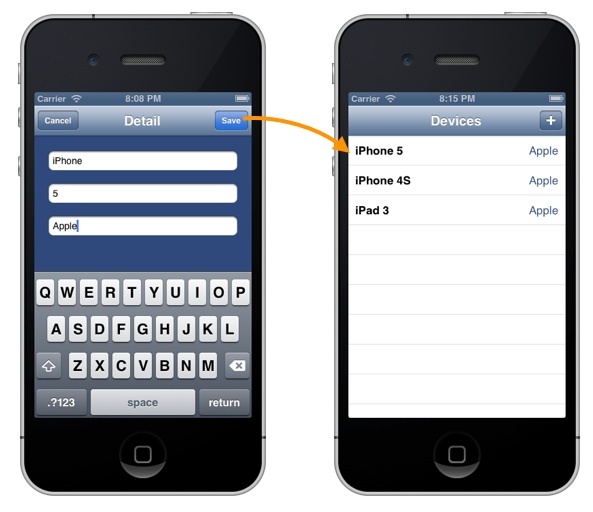 If you are creating a backend for your iOS app, it’s easier to stay consistent by sticking to one language and style. There are three excellent server-side Swift services out there: Perfect, Kitura, and Vapor. 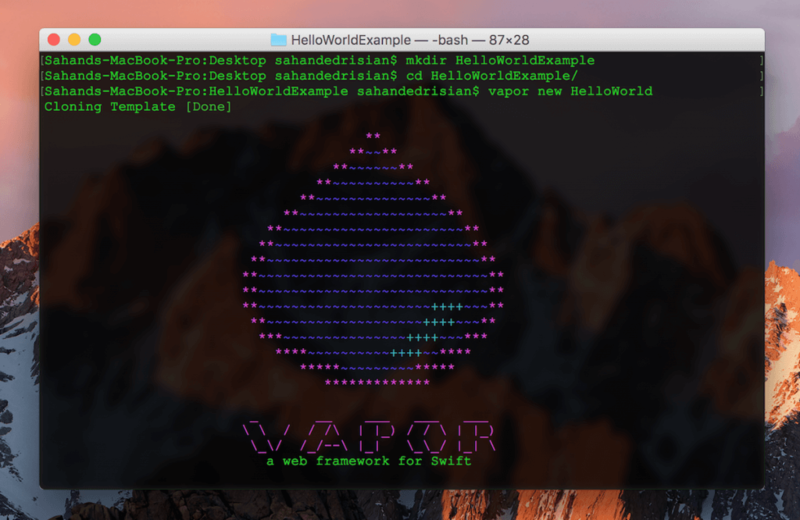 In this tutorial, I will explore the interesting world of Swift on the server with Vapor. I will teach you how to install Vapor and Swift 3, learn the basics of Server-Side Swift, and deploy your website/backend on Heroku. 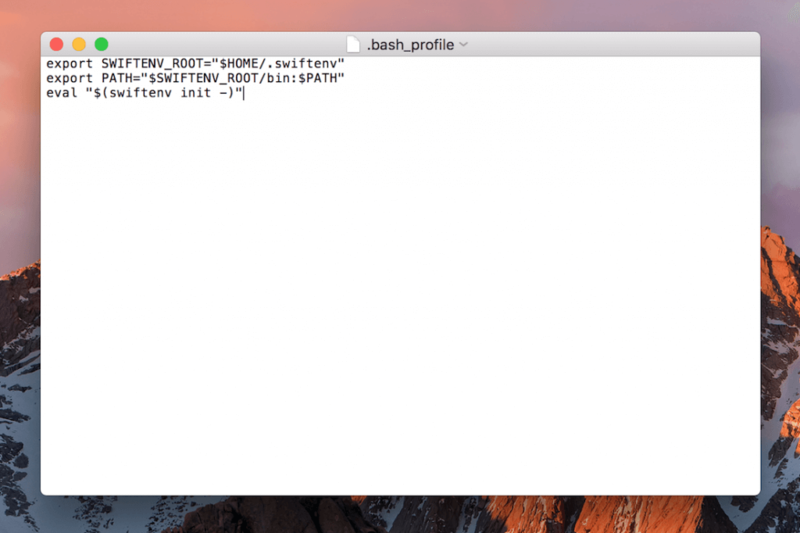 In this tutorial, we will be using a lot of bash commands, so it is important to have a basic knowledge of bash and the Terminal. Vapor runs on Swift 3, thus Xcode 8 is required. Vapor and any Swift (Swift Package Manager) project needs to run on Swift 3, so I recommend you to learn more about the changes in Swift 3 in this AppCoda article. 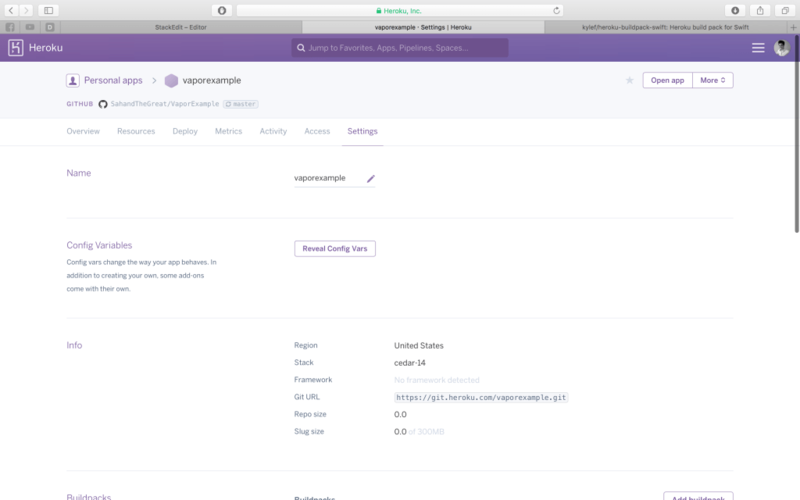 Towards the end of the tutorial, I will explain how to host your Vapor server on Heroku, a popular cloud hosting provider, so it is recommended to have some experience using it. Vapor requires Swift 3, and the latest version of Xcode 8 beta. 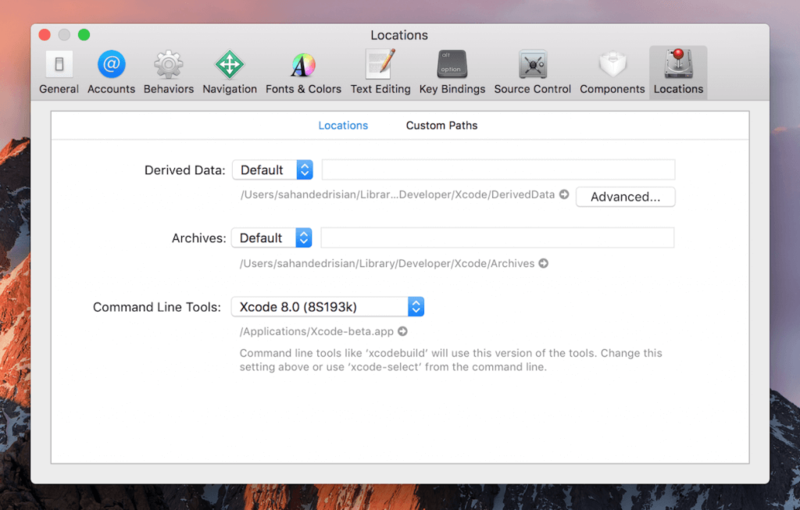 You can download the new Xcode GM here. First, you have to choose the latest command line tools. 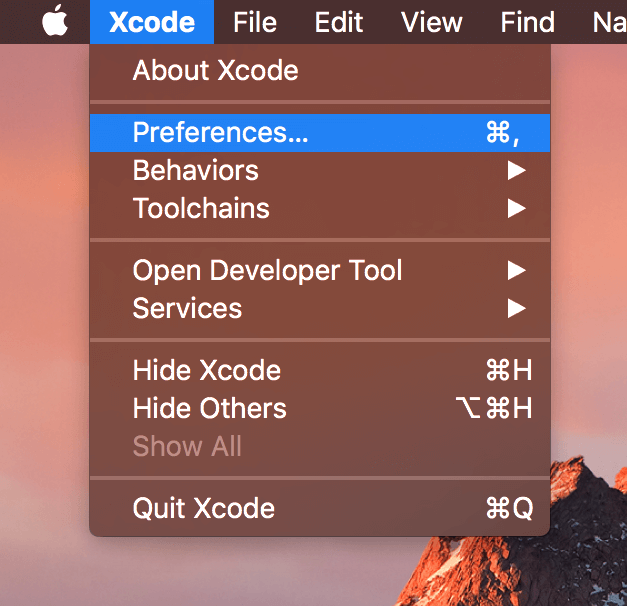 Open you Xcode preferences. 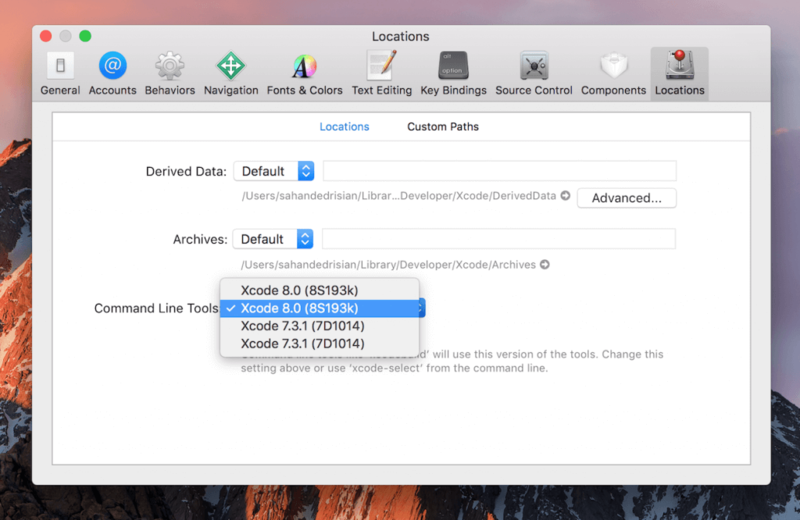 Lastly, choose the latest Xcode 8 command line toolset. When you see your bash profile, paste the following commands. These commands initialize Swiftenv. 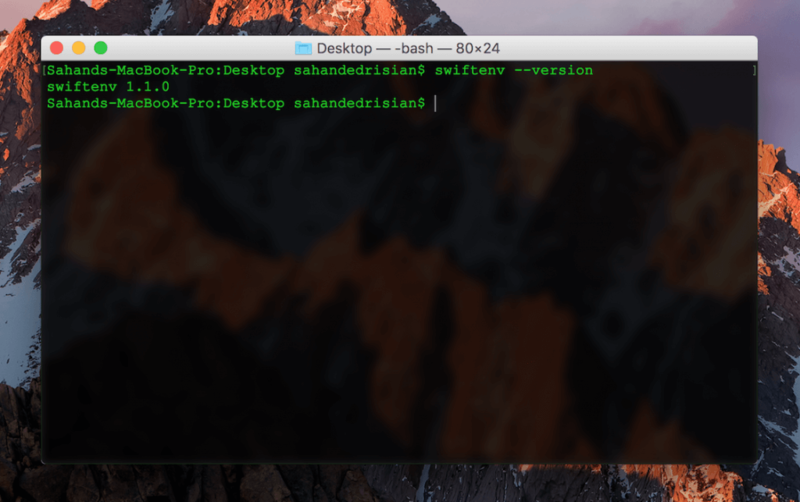 Your bash profile (opened in TextEdit) should now contain these commands. Note that in some cases your bash profile might contain other commands. Do not remove the previously placed commands, just append the new ones at the end of the file. Update: If 3.0-GM-CANDIDATE doesn’t work for you, please use DEVELOPMENT-SNAPSHOT-2016-09-06-a instead. You should see an asterisk next to 3.0-GM-CANDIDATE. If you get the green checkmark emoji, that means that you are set to install Vapor! Ok, this might take a while. You might encounter an error, e.g. : "Install failed, trying sudo". As long as you finally get the "Vapor Toolbox v0.10.4 Installed" message, you are all set up. If you get this result, congratulations! You have completed the most challenging part of this tutorial. Every Swift project uses the Swift Package Manager (SPM). Every SPM project requires a Package.json, a main.swift file, etc. The Swift Package Manager will look for the Package.swift file in your Swift project to download the necessary dependencies. SPM is similar to NPM (Node Package Manager). Vapor creates the Swift project, and adds the required dependencies to the Package.swift file. Vapor follows and enforces the MVC (Model, View, Controller) pattern. It creates the folders where Models, Views, and Controllers are located in. If you are not familiar with the MVC design pattern, click here to learn more. First, Vapor creates the Package.swift file. There is no need to modify it. Then there is the App folder, which contains the Models, Controllers, Middleware, and the main.swift file. 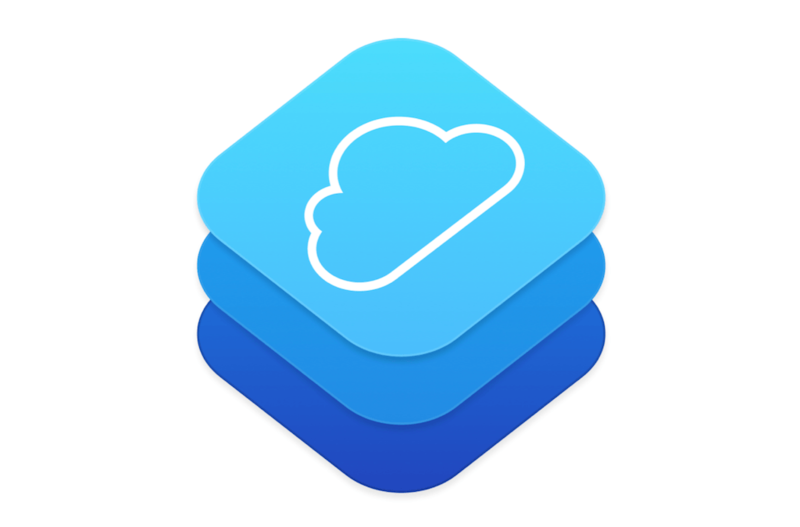 The main.swift file is our main app file, and where we initialize our server. Vapor will run this file first. The Resources folder contains the Views folder, where our HTML files and templates are stored. The Public folder is where our images and styles must go. We won’t be working with the rest of the folders for now. Vapor automatically creates an example project for us. It will create a Controller, Model, Middleware, and main.swift file. Open the main.swift file (under /Sources/App), and remove all the code inside it. A Droplet has a lot of customizable properties. It accepts a ton of arguments, all cited in the Vapor Docs. For this instance we don’t need to customize our Droplet. Finally, you need to call the serve() function. The serve function runs the server. Vapor doesn’t have a ‘special’ build or execution. 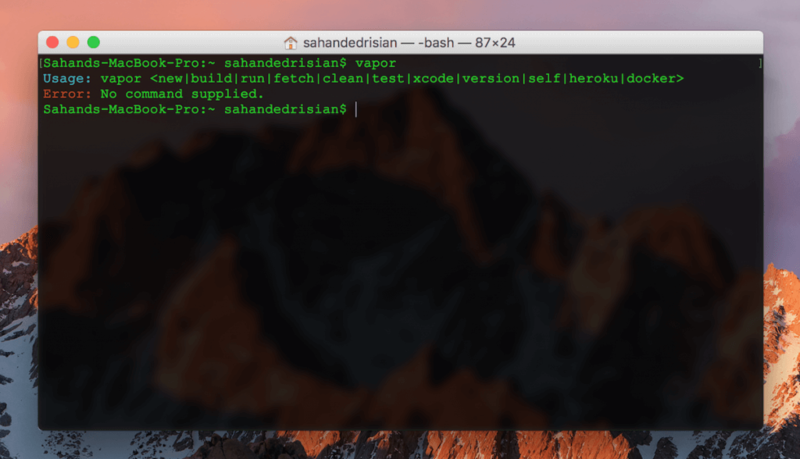 Running the vapor build command simply does a swift build . 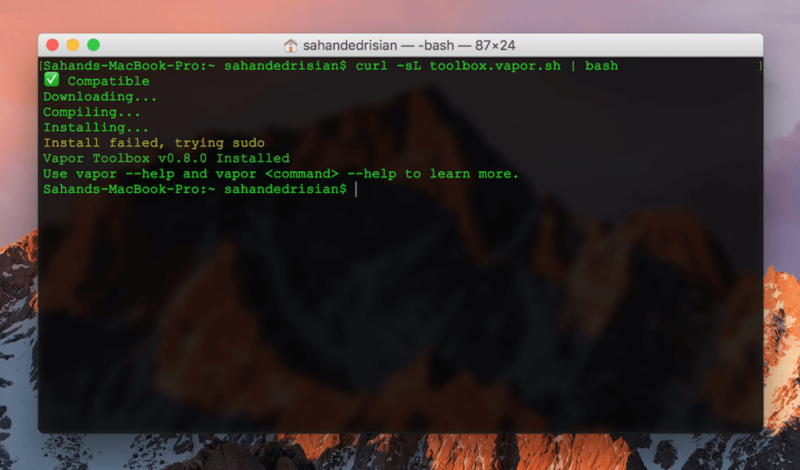 Entering the vapor run command will run the builds created in the .build/debug/ directory. You should see your incredible “Hello World” String! Note: Every time you make a change, it is necessary first to build, then run the project. If you only run the project, the previous build will be executed. Handling an HTTP request is similar to other frameworks such as Express, Flask, etc. We will cover GET in this tutorial. This way you could access the value of that parameter by supplying the key to a dictionary. The key, or the second argument, must start with a colon, which indicates that the name is the key of the parameter. 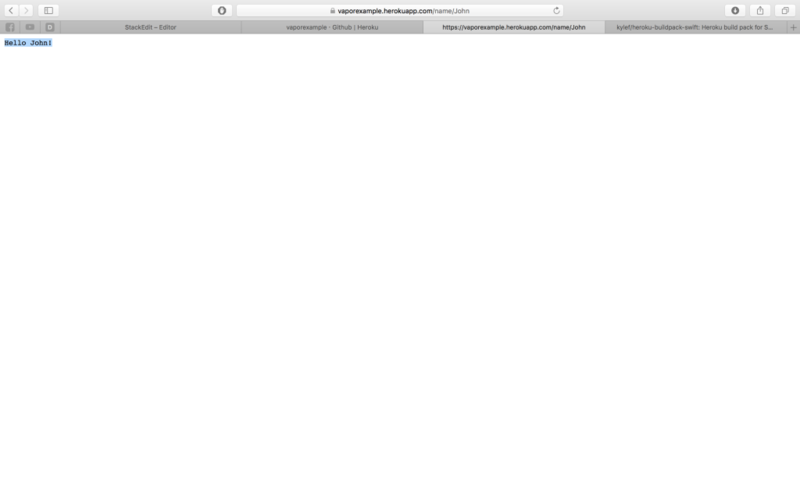 The HTTP request needs a response from the server. The response can be returned by just returning the function. In this case, we will return the name string, which was taken from our parameters dictionary. However if you intend to use the URI format, you could do so using the uri property of the request object. To learn more, visit the documentation for the request object. A Droplet has a view() function that take a string parameter. The parameter is the name of our HTML file. The view() function throws an exception, therefore it is necessary to mark it with the try keyword. If the view does not exist, the function will throw an exception. You can catch the exception with the catch keyword, but it is not necessary in this case because already we know the file exists. You should now be able to see the “Hello World” HTML file. To learn more about Templating and Rendering, visit the documentations. 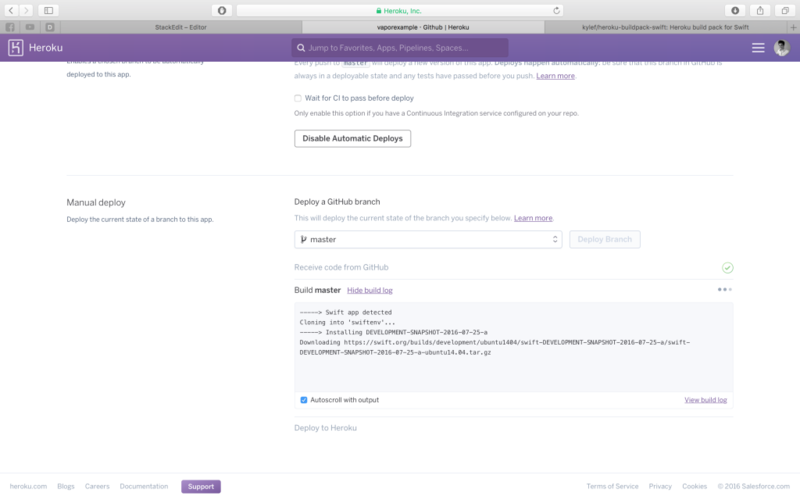 Heroku can build and host Swift projects. This is the best, and easiest way to deploy your Vapor project. This tutorial expects you to have some basic knowledge in regards to Heroku. 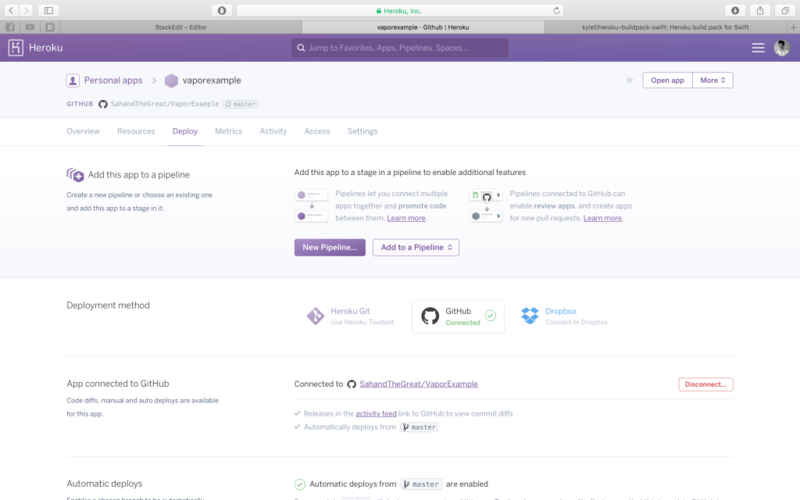 You can use the Heroku toolbelt in order to deploy this project, but in this tutorial, we will push the project to Github and link the two. Alright, now that you have finished pushing the repo to Github, go to your Heroku dashboard. Now create a new app, and name it whatever you want. First, navigate to your settings. Next, scroll down until you see the “Buildpacks” option. Then add a Buildpack with the link: https://github.com/kylef/heroku-buildpack-swift. The Buildpack builds your Swift project and tells Heroku what language it is in. Next, navigate to the Deploy section. Change the deployment method to GitHub, and add your GitHub Repository name to the app. This connects your Repo to Heroku. Scroll down to Manual Deploy and hit Deploy Branch. Building might take a while. 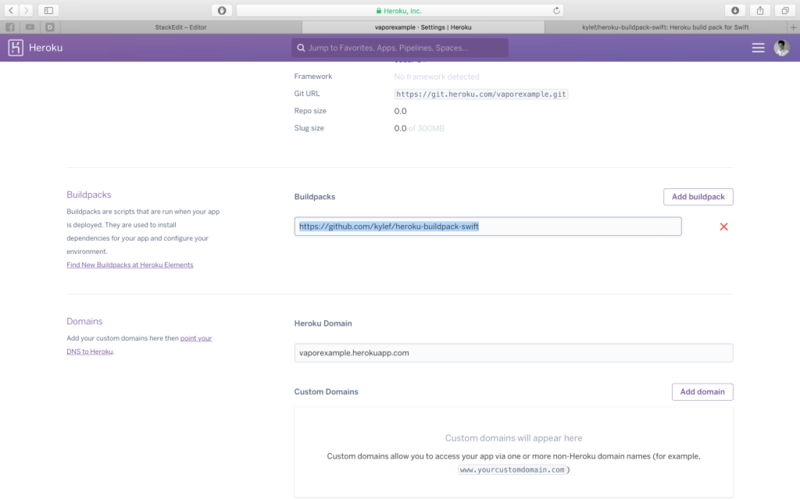 After it’s built, view your website from the link provided by Heroku! 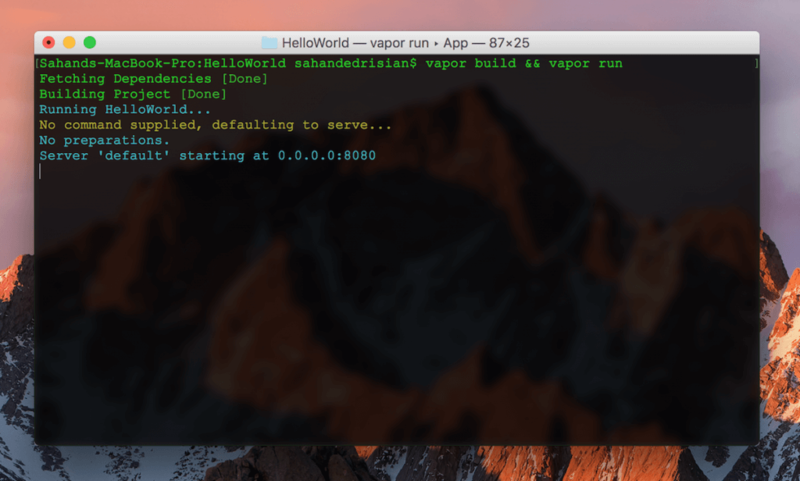 In this tutorial we covered how to install Vapor, create a Swift server, and deploy it on Heroku. First, we had to install Xcode 8. Then, we installed Swiftenv to easily download and install Swift 3. Next, we downloaded the Vapor toolbox. After that, I showed you the basics of routing and handling HTTP requests, and returning views. Finally, I taught you how to deploy your Vapor server to Heroku. I love Vapor. 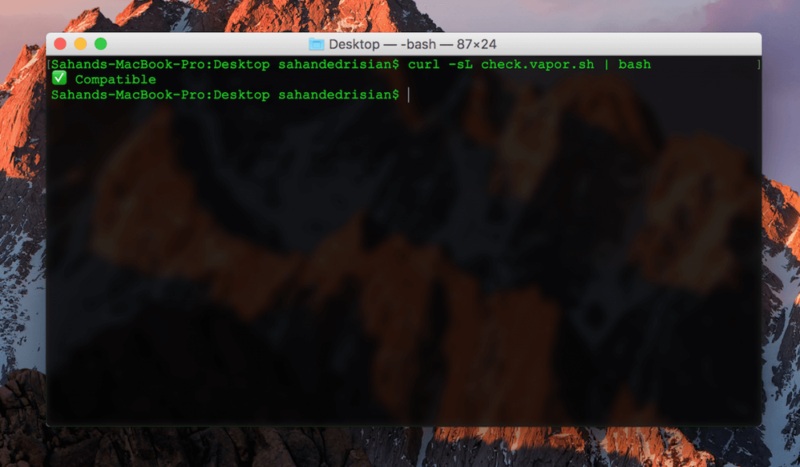 Comparing it to the other Swift-On-The-Servers out there, I think Vapor is the most useful and hassle-free service. IBM’s Kitura is a single dependency, meaning it forces you to work with other Swift dependencies out there that aren’t updated by the their own team, causing major problems. Perfect, on the other hand, is very large and bulky. Vapor relies on nothing but itself and maintains it’s ease of use. Templating: Similar to handlebars or angular. Database-agnostic models: SQL, noSQL, Mongo, you name it, Vapor covers it. Sockets: Vapor uses web sockets to make real-time connections. JSON Serialization: Similar to SwiftyJSON. MVC Pattern: Ability to create Controllers and Models. Middlewares: To add any parameters to HTTP requests. This is useful for APIs. Hashing: Vapor can hash almost anything for you. I hope you enjoyed learning the basics of Vapor! For your reference, you can download the full project on GitHub. There are many example projects made by the creators of Vapor, you can view them over here.